I have more than 30 years of utility bills at home. Every invoice since I’ve been a property owner. And despite being in the energy industry for the same amount of time, which may explain the boxes and boxes of bills, I have yet to do a thorough analysis to understand exactly where my money goes. At the same time, I know it’s difficult for family and friends outside the industry to make any sense of their bills. From surcharges to taxes to fees, understanding the intricacies of a utility invoice — and opportunities for savings — is challenging. So, in the end, we all do a quick skim, head online and pay the piper. It’s mildly irritating to be sure. But that same mentality, just paying the bill without understanding each line item, is more than just a nuisance for businesses; it could mean they’re paying way more than necessary. Millions more, depending on the size of their energy spend. “How can that be when energy prices are reasonable right now?” you ask. It’s true that the low cost of crude oil has suppressed natural gas and electricity prices. But that doesn’t mean companies are getting a great deal on energy. In fact, the actual electrons used to power a facility or any type of operation account for less than 50 percent of a utility bill. The other half of the pie, known as non-commodity charges, now makes up a majority of each invoice and continues to grow. For example, one of the costliest and often-overlooked non-commodity elements is capacity charges — fees assessed based on the amount of electricity consumed during periods of peak energy use and stress across the entire grid. It’s basically the price users and suppliers pay to “play” in the market and it’s wholly influenced by the cost to transport the electricity from the generating facility to any site. So how can organizations trim and hedge against these charges? Here’s the answer and insight into two other categories of a utility bill where substantial savings lie in waiting. These tags usually get set every year. And a variance up or down can have a considerable impact on costs. The trick is finding a way to reduce them because a lower tag means lower fees. Having a basic understanding of what a site’s capacity is and how to control it enables energy managers to limit peak-load contributions and shrink utility bills. Companies can also embed capacity tags into a fixed energy price. But this approach is less than perfect. Yes, a fixed price provides certainty and protection from events such as a polar vortex, which can lead to higher-than-normal energy use and ballooning invoices. However, that same fixed price means suppliers are taking the marketplace risk and companies are likely to pay a premium, spread out over a long period of time, as a result. 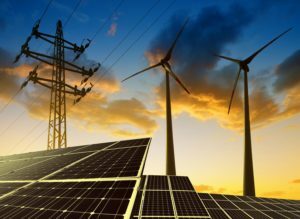 With more and more renewable energy assets coming online, there’s a greater need to connect them to the grid so utilities can distribute the power they generate. The cost to bring these new energy sources to the masses is typically passed on to commercial and industrial companies, as well as individual consumers. Plus, utilities have committed to invest more in renewable energy — from $135 billion in 2014 to $250 billion by 2030, according to the International Energy Agency — so these charges will only continue to rise. Forward-thinking companies, however, can really change the game with renewables. For instance, some organizations use waste feedstock to generate energy to use during peak periods, and thus reduce their capacity tags and costs. Onsite generation also acts as a hedge against both electricity price spikes and green energy fees from utilities. As governments promote sustainability, incentives and subsidies exist for implementing efficiency measures and introducing renewables into the portfolio mix. For some companies, these subsidies can equal upwards of 7 percent of their energy bill. Organizations can even earn tax-exempt status for implementing co-generation, or changing manufacturing and heating processes. However, to do so, they first must know what incentives are available and how to comply with the related requirements. And that requires a deep understanding of the energy landscape. Complications also arise where fast-changing local, regional and national regulations interact. 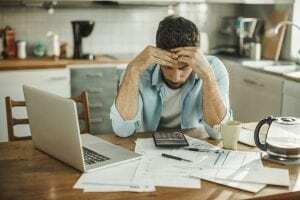 So the next time a utility bill arrives, don’t just knock back a few aspirin because of information overload and forward it to accounts payable. Understand all the elements — and then use that knowledge to lower costs and achieve sustainability objectives. 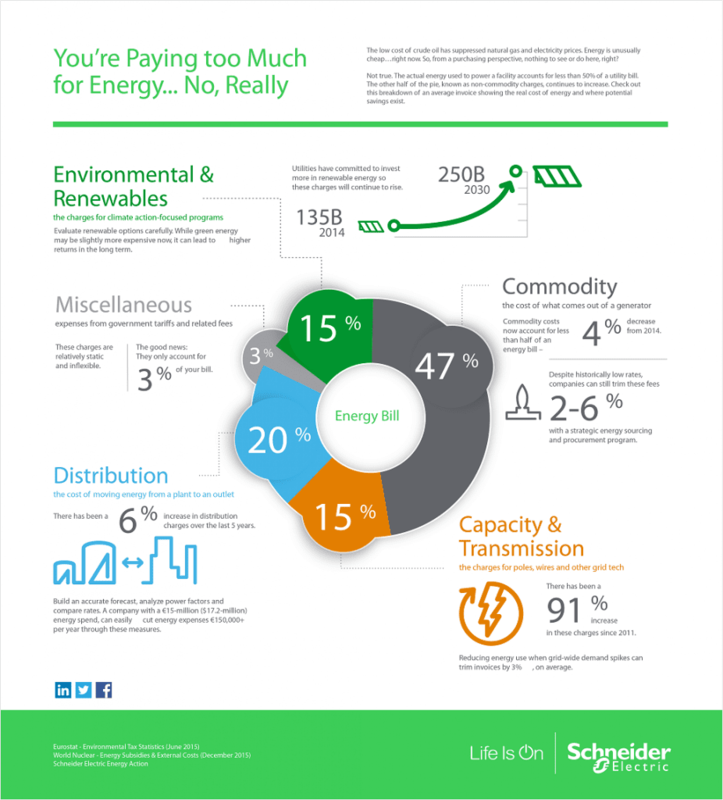 To learn more about your energy bill, download the infographic below. You can also visit seESS.co/2zwf.